Weight Watchers is a popular weight loss plan that works on a points system. All foods are assigned a point value based on their fat, calorie, fiber, protein and carbohydrate content. Members are assigned an allowed number of daily points based on current weight, age, gender and level of physical activity. The goal is to eat a well-balanced diet that includes a wide variety of foods while staying within the daily point allotment. Eating breakfast is an important part of the program; and while no foods are off limits, some foods make it easier to stick to the plan. Eating breakfast is an important part of a weight loss and weight management plan. After going all night without food, your metabolism tends to slow. Eating a healthy breakfast helps to give your metabolism a boost and to curb hunger later in the day, says Weight Watchers. Choose foods such as a bran muffin with a glass of milk, which will help you feel full and satisfied, versus a sugary cereal or a glass of sugary juice. Sugar is digested very quickly by the body, which can leave you feeling hungry later on. When hunger is driving food choices, you may reach for high-calorie or unhealthy foods. Be sure to choose low-fat bran muffins or make them at home; lower-fat and -calorie muffins can be worth 3 to 6 points, whereas a bakery bran muffin can cost you 10 to 12 points. If you are allowed only 20 or 25 points per day, you will be using up a lot of them for just one meal. Going for long periods without food, such as skipping breakfast in the morning, may increase the amount of insulin the body releases when you do eat. This increase in insulin can lead to excess fat storage and weight gain, reports MayoClinic.com. In fact, those who skip breakfast tend to be heavier than those who eat breakfast on a regular basis. To avoid surges in insulin, go for a high-fiber breakfast such as a bowl of oatmeal with fruit on top or on the side. Fiber takes a long time to digest and therefore keeps insulin levels more steady. Most brands of oatmeal are worth about 4 points per cup, and most fresh fruits have a point value of zero per cup, making this a healthy, filling and low-point breakfast. A high-fiber breakfast not only boosts metabolism and curbs hunger; it also helps in the fight against heart disease. A general goal is to get 25 to 35 g of fiber each day, and including it in your breakfast can help you meet that goal. Having a small amount of protein can help to curb hunger even more. If you are short on time or need to eat on the run, the Cleveland Clinic recommends two slices of low-calorie whole wheat toast or a small whole grain bagel topped with 2 tbsp. low-fat peanut butter or cream cheese. The whole wheat breakfast will cost you only 4 or 5 points, and the bagel breakfast will cost you about 6 or 7 points. Those who eat a high-fiber, healthy breakfast not only tend to weigh less; they also appear to have a lower risk of heart disease, diabetes, intestinal polyps and colon cancer, notes the Harvard Medical School. 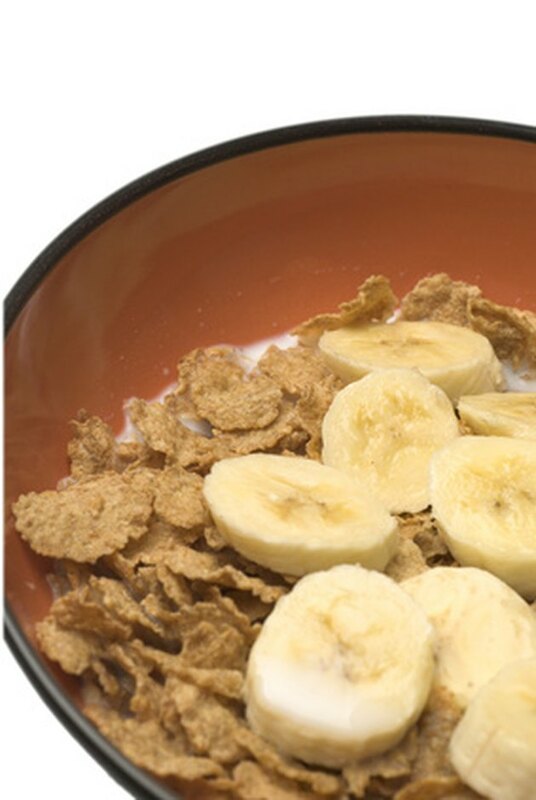 A good breakfast choice is a high-fiber cereal that contains at least 6 g fiber and less than 10 g sugar per serving. Adding a cup of low-fat yogurt or fresh fruit to your high-fiber cereal can boost the fiber content even more. The fiber content of yogurt varies greatly, but Weight Watchers yogurt is high in fiber. Cereals vary greatly in their point values, ranging anywhere from 3 to 6 or more points per cup. The lower the fat, sugar and calorie content per serving and the higher the fiber content, the lower the point value. A cup of low-fat yogurt can add between 1 and 3 points to the meal, but this breakfast is a healthy choice overall.